We wanted to pass along some helpful tips to help your kids stay healthy and avoid catching the flu. At Treasure Tower we do a lot of work with dentists and pediatricians, with a goal of rewarding well behaved kids to make appointments stress-free for everyone involved. If you are looking to add a rewards system to your practice, call us today! The first line of defense when trying to avoid getting sick is proper hand washing, which many people don’t practice. To combat germs and illnesses, wash your hands in warm water with soap for about 20-30 seconds for best results. Let kids know how important it is to have good hand washing habits, not just for their health and safety, but for others around them. If they’re having trouble doing it long enough, take this time to review things they’re learning in school like numbers or the alphabet. Washing hands isn’t the most exciting thing in the world, but if you can take advantage of this time it will feel more worthwhile for you and the kids. Advise them to wash their hands before and after eating and after they touch a door handle especially, as this is how most germs are spread. Depending on your kid’s demeanor, this could be easy or incredibly difficult. It’s important to make sure your body gets an appropriate amount of rest to ensure immune systems are working properly. If you’re unsure of how much sleep might be recommended for your child, WebMD made a helpful resource that breaks it down by age groups. You may need to be stricter with bedtimes in order to make sure they’re sleeping long enough. It can also mean you might need to be stricter about rest in general. If your kiddo is being cranky, maybe nap time is a better choice than having a playdate. One of the best ways to bolster a budding immune system is with a solid diet filled with fresh fruit, veggies, and plenty of water. We know how picky children can be, so if there’s just one type of fruit or vegetable they will reliably eat, stick with that through flu season, as long as it’s fresh. Many canned or frozen options have added sugar and sodium that should be avoided when possible. Don’t make this the time you try to get them to eat something they don’t like. The main goal is keeping them healthy, so that’s a battle you can fight after flu season ends. Staying hydrated is one of the most important things for healthy grown-ups, so it stands to reason it would be just as valuable for kids. When you’re hydrated your immune system will work better. If you’re dehydrated, you’re much more susceptible to catching and keeping any germs you run across. Making sure your child is drinking enough water can be a bit of a battle, but it is possible. If your child’s school allows it, send them to class with a water bottle and challenge them to finish the bottle before they get home. Kids love to stick their hands in their mouth and rub them all over their face. Typically occurring more in younger children, it can be anything from dealing with teething or exploring their new tactile function. However, this is how most germs spread. Teach them to stop doing this, as your fingers don’t belong in your mouth. Remind them that this is where germs come from. Most kids hate getting sick, so implying they won’t be able to see their friends if they get sick is a pretty good motivator. When you’re out and about, it can be tough to practice good hand washing habits. Unfortunately, out in public is a veritable breeding ground for germs. Combat this by keeping a bottle of hand sanitizer or package of wet wipes on you at all times for on-the-fly cleaning. Try handing your child a wet wipe to clean their hands with right after you pick them up from school to take care of any germs they could be bringing home from their classmates. Just like preventative maintenance, a flu shot can help you and your family dodge influenza with no problem. Many doctor offices and pharmacies provide flu shots for pretty low prices, if not free. Immunization is no joke and can help us all stay healthier. If your child has trouble eating healthy fruits and vegetables, you can try vitamin supplements to recover what is not being eaten in their normal meals. Vitamins D and C are both tied to immune system function, so they can help a lot with getting through the season. Consult your child’s physician to get the recommended vitamins and dosage information. Staying active boosts the immune system and strengthens all bodily functions. When paired with the other pieces of this list, they become a united front standing in the way of dastardly germs that only want to get your family sick. Have your kids exercise at least 30 minutes a day to ensure their immune system stays strong and ready for battle. This goes hand-in-hand with the healthy diet, but sugar warrants its own entry here. Why? Sugar suppresses immune systems, actively working against the rest of your body’s natural defenses. It does that by inhibiting phagocytosis, which is the process of white blood cells fighting off viruses and bacteria. Sugar can begin suppressing the immune system as soon as 30 minutes after eating it, and it can last up to five hours. When you’re trying to dodge something as tricky as the flu, having your immune system not functioning properly for that long puts you at serious risk when you have germs all around you. It’s important that antibiotics are only being taken when dealing with a bacterial infection. While they help with bacterial infections, they also disrupt normal processes in your stomach, which can result in health issues and a weakened immune system. Make sure you are following doctor’s orders when giving your child medicine so you do not exacerbate the situation. Catching the flu is no fun, so we hope these tips will help you and your family dodge the bug this season. Practice healthy habits, get enough rest, and forgo the sugar and you should be in good shape. If your dental or medical office is currently using an open treasure box system for your toy rewards, you know children LOVE to dig in and hunt for their favorite toy. Since our Treasure Tower is a closed toy rewards system, children can’t dig through the toys in our Treasure Tower, greatly reducing the amount of pathogen transfer that can occur in an open treasure box system. Our Treasure Tower can help to solve pathogen transfer and provide sanitary toys for children. If your child’s doctor doesn’t have our Treasure Tower, consider asking them to look into our Treasure Tower Rewards Program. If you’re a dental or medical practice that treats a lot of children, consider adding a Treasure Tower to your office. It’s a great way to motivate children and reward little ones for being brave and well-behaved. When holidays roll around, family pictures are sure to follow. Those pictures will be keepsakes for generations, so you don’t want your kiddo immortalized in the family scrapbook with a wild and unruly mane. Some kids don’t have any issues with haircuts, but many more throw some notorious tantrums at the mere mention of a “cut”. How can you make it an easier experience? We’ve compiled some recommendations to help children stay calm and occupied through a haircut. If you run a hair salon and are looking for a way to reward well-behaved kids, contact Treasure Tower to learn about our Treasure Towers and our reward system. One of the biggest things a kid wants, but rarely has, is control. Let them choose what type of haircut they want to get — within reason of course. Another smaller bit of control you can give them is a choice of what colour comb they want to be used. Giving a child the feeling of choice and control helps them stay calm. Especially when they choose their own style, you can use that as incentive. When their behavior is tied directly to something they want, they will often behave better. Outside of giving them control over their choice of haircut, color of comb, etc you can incentivize them in other ways. With our Treasure Tower, your hair stylist can reward good behavior with a token, which your child can use to choose their own toy after the haircut is completed as a reward for good behaviour. That gives them control over their reward and the power to choose. Finding something that can hold your child’s attention can take their focus away from the haircut. A favorite toy, a movie on a tablet, putting stickers on the gown they can pick away can all help them stay calm and still enough for the haircut to go off without a hitch. Some kids find music comforting, so try singing a song with them to give them another thing to focus on. A lot of kids get scared of haircuts simply because of one word — cut. They associate cuts with pain and it immediately freaks them out. You can avoid this just by calling it a trim. Kids don’t have the same association with a trim, so a lot of the time this is a simple fix to keep them calm. Some stylists have demonstrated what they’re going to do on a doll with plastic hair, which shows there isn’t anything to be afraid of. Another idea is for one of their parents or sibling to get a haircut first, while they watch on. Most of the time this makes them more curious about the process than scared. Try sitting your child down to show them what a haircut is like. Use your fingers as scissors and go through the motions. Add in a spray bottle, comb, and hair dryer to complete the scene. Help them understand how everything works and they won’t have the fear of the unknown that can bring about obstinate behavior. If you’re a hair stylist and looking for a great way to reward well-behaved kids in your hair salon, call Treasure Tower! We’ve got tons of options for toys kids love and will work hard at behaving in your chair. Going to the dentist can be stressful for everyone, but it’s especially true for kids. The whirr of a drill mixing with the fear of having a cavity; it’s pretty harrowing when you don’t know what’s going on. When nearly 20 percent of children have a fear of the dentist, it’s certainly a situation that needs to be handled properly. When a child is stressed, it not only makes their appointment unpleasant for them, it makes it difficult for the dentist or assistant to complete the work needed for the appointment. We’ve compiled some tips to help a little one avoid becoming overwhelmed when they’re getting their teeth done. When you’re looking to reward well behaved kiddos, check out Treasure Tower World! Children are curious by nature. Everything is new to them at these early stages, so they have a lot of questions. One of the biggest causes of stress in anyone’s life is fear of the unknown. A fear of the unknown mixed with an overactive imagination combine to make the most horrifying idea of the dentist possible. The easiest way to avoid this anxiety is simply by letting the child know exactly what’s going to be happening in the procedure. Describe the noises, the feelings, even the taste of the fluoride that’s going to be used; the more information a child has before the procedure, the more prepared they are to handle it. Depending on the age of the child, you may need to act out the procedure so they understand what to expect non-verbally. Then, once you have made sure the child is on the same page, they’ll be ready for the procedure to begin. If a child is visibly anxious, or tells you they are stressed, there are some relaxation techniques that can work quite well. Many kids have had positive reactions to something as simple as a deep breathing exercise. Others have found success blowing bubbles, which can also provide a distraction. In case those steps don’t work, you can try the more in-depth process of progressive muscle relaxation. You’ll walk the child through systematically tensing up and relaxing each muscle group. If you’re unsure about properly walking the child through this process, recorded versions are available that can instruct them. One of the most effective ways to handle dental anxiety is just distracting them from the procedure. There are many ways to effectively distract them that you can consider. If the procedure allows it, something as small as letting a kid hold onto their favorite toy can redirect their focus enough for a cleaning to be completed. Try starting a conversation with the child. Ask them about their summer vacation, how school is going, or what their favorite TV show is. This gets them thinking about things not related to the dentist and allows them to ease their nerves a bit. Another option for distraction that clinicians have reported works well is visualization. Ask the child to visualize and imagine a nice moment. This could be something like a recent trip to the zoo or a favorite birthday party. In order for this to work properly, the child needs to really feel like they are going through this positive memory again. To facilitate this, a clinician may need to ask questions to help the child build in the details of the memory. TV, movies, and video games are all fantastic distractors as well, but will only work if the child is interested in their subjects. Having a wide variety for them to choose from will maximize the effectiveness of the distraction. Though it’s not always possible to have a parent in the room while the procedure is going on, nobody knows this kid as well as their parent. They will have a better idea of what approach will help their child the most, things to avoid, and even specifics about the fear the child may not be comfortable sharing. A parent is a great example for children to follow, so consider employing them to demonstrate the procedure for the child. This will give them an understanding of what to expect while showing them how to act through the procedure. If this is executed properly, it can inspire future good behavior past the current day’s procedure. Consider using praise and small, but tangible, rewards as incentives for cooperating and being brave. It’s important the clinician is genuine when offering the positive reinforcement for it to be effective. Don’t hesitate to ask the parent what type of reinforcement works best for their child, as everyone is different. 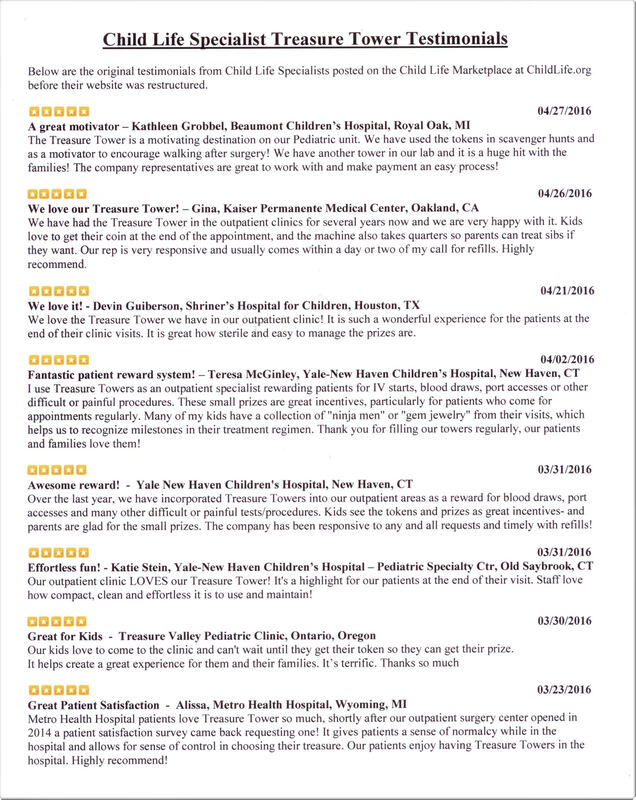 For the best way to reward your patients for good behavior, call Treasure Tower today! We’ve got a wide range of reward systems, exciting vending towers, and toys that kids love. The Treasure Tower makes rewarding kids fun, easy, and most importantly, affordable. Rewarding a child for positive behavior is kind of a tricky subject, because it is a balance that needs to be found and managed. Too many rewards can have a negative effect, making a child believe they are owed something, just for behaving. However, if it is applied with a measured approach, it can teach children good habits going forward. The first step to a successful reward system is to understand the mindset behind why you are doing it. Some parents have said they avoid rewards because they don’t want to ‘bribe’ their children to behave. It’s understandable why they can see it that way, but with a different perspective, rewards can be used as incentives to help children learn. Think of it as a tool in your parenting toolbox. Not every situation needs a hammer, but a hammer has a purpose and intended use. Rewards work the same way. If it’s not employed in a manipulative manner, it avoids becoming a bribe. An important thing to keep in mind is that the positive behavior you are looking for should be something age appropriate and manageable for your child. If it is too easy, a lesson isn’t really being learned. With a task that a child sees as achievable, it is more likely they will see it through than if it is too overwhelming for them to wrap their head around. Small successes help a child grow and breed a desire to accomplish more. If a child is given a task they don’t really believe they can actually do, it’s far more likely they will walk away from it, regardless if there is a reward waiting for them at the end of it. As your child achieves and completes goals, it’s a good idea to evolve the reward system. Over time, increasing the challenge of the goals as they learn and grow will help them gain understanding about what can be accomplished, instilling a desire to learn more and a desire to complete more difficult objectives. Creating a framing device for your system can help a great deal as well. Kids love to use their imagination and it can create an interest in doing something they may not have been interested in before. Say for instance, your daughter loves princesses. If you want her to clean up her dirty clothes, frame it as, “We’re going to have a tea party and the guests are on their way. We need to make sure the royal tea room is ready for them to arrive!” With the end reward being a tea party, it just gives a little incentive to get the job done, while keeping you involved and a part of the reward. When designing your goal system, it’s a good idea to involve your child in determining the rewards they would want for completing a task. It’s pretty tough to motivate someone if the reward they get isn’t something they want! Some good examples of rewards would be small items like stickers and coloring books, special privileges like a sleepover or choosing dinner for the family, a fun activity like going to a movie or the zoo, or some special time with a parent like the tea party we described. In making your goal board, assign point totals for tasks completed and lay out exactly how many points will be needed to reach a goal. You can assign specific rewards to specific tasks, or keep track of points and let the kid decide on what reward they want. If there’s something really big they want, this is also a good way of teaching how to save up for something. That creates the foundation for learning about the value of money early on, prior to actual money being involved. For instance, a coloring book could be worth five points, but a new video game is worth 60 points. We recommend creating an actual, physical goal board that is in writing and in your control. Having a way to keep track of progress is important to both parent and child. Some parents make goal boards for each positive behavior they want to teach, others combine them all into one. It’s really a matter of personal preference and how much separate calculation you want to do in tracking achievements. When tracking these goals, it’s recommended to go over what was accomplished at the end of the day for younger children and at the end of the week for older kids. At the start of a rewards system, it’s a good idea to monitor the behavior to ensure the tasks are being completed properly. While this may be a considerable time commitment, it is putting in place the building blocks needed for the behavior to take hold without your supervision. If they don’t understand how to do it right when they start, it’s more likely that behavior will be avoided or ignored. Once completed, show the child that the task is being tracked on the goal board. That shows something has been accomplished prior to a reward being given. The biggest thing to keep in mind is how your statements are worded regarding the incentives. It sounds much more like a bribe when you say “You can have some chocolate milk if you stop screaming.” This ends up rewarding the child for the negative behavior instead of the positive. By establishing the reward program early, it sets the expectation that only positive actions will result in positive rewards. Test out one goal board with one solid goal at first. This will ensure the child doesn’t feel overwhelmed by the number of tasks ahead of them. As they accomplish things, unlock new tasks and rewards previously unavailable to them. That gives a sense of progression to the accomplishment while measuring out the amount of goals and their difficulty at a manageable level. A reward system is just one of the many ways you can incentivize your child to behave in a positive way and works well in conjunction with other teaching methods. Helping motivate children early on to accomplish goals can help instill a drive in them that will last long into adulthood. And if you’re a dental office looking to provide a rewards system to reward children for good behavior, look no further than Treasure Tower! There is no better way to reward kids, encourage good behavior, and build confidence than by owning a Treasure Tower for your medical or dental office, restaurant, salon, or school. Call us today! Every parent has been there. Every parent knows exactly what it’s like to have a child scream their lungs out at the doctor’s office because of a procedure, injection, or blood draw. In fact, your child could be perfectly fine for one visit but screaming at the top of their lungs the next. While you know how important it is for your child to see the doctor and get their shots, you also probably dread the tears that come with it. So what do you do about it? You can try and bribe your child, but until they’re at least two years of age, they don’t really understand the concept of IF you do something, THEN you get a reward. In addition, even older children struggle with this if they aren’t rewarded right away. Treasure Towers toy machines are the perfect solution, and if your doctor’s office doesn’t have one, it’s time to ask them to step up. A Treasure Tower reward toy machine can be the answer to no more tears at the doctor’s office when it comes time for your child to get their shots. Treasure Towers are the perfect toy machines for a medical setting in order to reward children quickly, affordably, and sanitarily. There is no other children reward system that can boast all of those benefits. Even doctors don’t like to hear children cry, so for older children, here’s what you do. At the beginning of an appointment both the doctor and parent can make it clear that if the child is brave and gets their shots that will only pinch a little, then they will receive a special token. Upon completion of the appointment with success, the child will be given the token to redeem at the Treasure Tower. They can choose from a wide variety of toys in order to pick one they like and the token is placed in the machine to pop out a capsulated toy. Children won’t be digging in a treasure box full of germs and taking more than they’ve earned. They can only redeem the one token for one toy. The best part is how quickly a child can be rewarded with their token and then redeem it. Then they know exactly what they did right for improved behavior in the future. No one likes to see a child cry, least of all parents and doctors, but it’s simple and easy to help improve overall behavior and reactions when it comes to doctor’s visits. Having the proper reward system in place in a medical setting can greatly improve overall behaviors. In fact, Treasure Towers can even give a child something to look forward to when visiting a doctor! If you’re a medical provider, then you a Treasure Tower today in order to see fewer tears from your young patients. If you’re a parent, take the time to recommend Treasure Towers to your provider in order to help your child learn to love visiting the doctor. Teachers have one of the hardest jobs in the world: educating youths and the adults of tomorrow. Often, this can be a very trying job as teachers aren’t just educating and dictating lessons to children, but also helping them learn life skills or cope with difficult situations at school or at home. Teachers do so much for children, and it can often be hard to figure out how to best help students and motivate them to strive for more. Studies have regularly shown that the best way to change behaviors or encourage positive actions is through positive reinforcement. If a child misbehaves, we may have the urge to chew them out, yell at them, or put them in timeout, but often, these methods are not very effective, especially for children who have problems that extend outside the classroom. So what do teachers and other educational providers need to be doing in order to help their students succeed? Reward based systems are shown to be the best way to encourage positive habits that you want to see in your students. It doesn’t matter if that means a student gets a reward for sitting still for an afternoon or if they completed their weekly reading assignment, allowing them to gain positive encouragement for a task that may be hard for them can truly help a child grow. This where a Treasure Tower Rewards Program can be exceptionally helpful. The Treasure Tower program is an affordable and effective way to reward a child for doing the right thing. Once children hit roughly three years of age, they can understand that if they accomplish a certain task, then they can claim a reward. Prior to this age, “If/Then” statements don’t mean much. But elementary aged children can understand expectations. If they turn in their homework for the whole week, then they receive a token for the Treasure Tower. When your educational institution purchases a Treasure Tower, you’re opting for a positive rewards program that helps create an event for young children. By receiving a token for positive behavior, a child is instantly rewarded and recognized for this behavior. They can then go to the Treasure Tower at a designated time and receive their prize. Treasure Towers come with either four or eight unique canisters in order to fill them with fun, little, vending machine toys. These can include anything from erasers to stickers, mini cars to sticky hands. A child with a token gets to choose a unique capsule toy of their liking, adding to the sense of accomplishment. This positive reinforcement will help to continually encourage good behaviors from students. Not only can teachers reward children with tokens, but so can administrators. Any time an adult catches a child in an act of kindness, they can instantly receive a token. When you opt for a Treasure Tower Rewards Program in your school, find a location that is central for the tower. Perhaps the office or cafeteria. Also consider enacting some ground rules about when kids can redeem their tokens and some sample situations that might merit a token and reward. Help encourage teachers to utilize this technique in their classroom in order to have a clear, school-wide positive reinforcement plan. It’s easy to get started and easy to fund a Treasure Tower in your school. Whether you do a small fund raiser, ask parents to contribute a couple of dollars a year, or have the PTA help fund the Treasure Tower, it’s well worth the effort. Let Treasure Tower help to bring good behavior to your elementary school. Teaching children how you would like them to behave, especially in public places, can often be a struggle. If you’re a parent, you’ve probably gotten the stares from other adults and the shaking heads when your child had a temper tantrum at the worst possible time. It’s hard not to react at those times. Even as a business owner or worker, it’s hard not to judge parents when their children have meltdowns when you’re trying to work. When this happens, children are often punished or receive some form of negative reinforcement. Unfortunately, this isn’t always the best way to teach children the way that you actually want them to behave in public. But what if there were ways that you could help avoid the situation altogether and mitigate meltdowns in public places? Positive reinforcement for good behavior is one way to help improve a child’s overall behavior and experiences in public. Here’s how to implement positive reinforcement training anywhere. We all know it’s easier to correct and be negative when a child is acting out, but reinforcing the behaviors that you want to see can make a big difference in a child’s behavior. Specific verbal reinforcement can help to teach children when they’ve done something right. Provide very specific praise when you see them acting in a positive fashion. If a child is kind to another child or they are polite, using please and thank you, make sure to tell them specifically that they did a good job. Along with verbal reinforcement, you should also consider using non-verbal reinforcement. Rubbing a child on the back or providing them with a reward from a toy machine can help to remind a child when they’re doing the right thing. Treasure Towers make it easy to reward children non-verbally with affordable toys for positive actions, by presenting a token when they have earned it. While it can often be hard to ignore negative behaviors, and some behaviors need to be addressed promptly, it can be a beneficial training technique to ignore mild negative behaviors. Often, children will act out for attention, and by providing it, you’re rewarding them for the behaviors that you don’t want to see. Opt to let them cry it out in the car or fight through to ignore them if you’re on the phone and vying for your attention. Once the negative behavior has stopped, you can reward them with your attention for the first, small positive behavior they show. The hardest part about positive reinforcement is simply making it easy to incorporate into everyday moments. By making it easy to provide this reinforcement, either verbally or non-verbally, it’s much easier to teach a child what you expect of them. Treasure Towers makes it easy to reward a child with a token which they can redeem for a small toy at a later time. Help parents and help yourself by purchasing a Treasure Tower for your place of business. Reward kids for positive behaviors promptly and effectively with this affordable kid’s reward program. How Does The Treasure Tower Rewards Programs Work? Here at Treasure Tower Rewards Canada, we’re the premier rewards program throughout all of Canada that encourages children to show good behavior. When it comes to your business, if you work with children, you probably know how difficult it can be to get some kids to behave. Whether you’re cutting their hair or trying to encourage them to turn in homework, there are some kids who simply don’t respond to polite requests. That’s okay, because the Treasure Tower Rewards Program is here to save the day! What is the Treasure Tower Rewards Program? Treasure Towers are unique toy machines that utilize tokens or quarters in order to provide a reward for children who show good behavior or listen appropriately to adults. A Treasure Tower contains four to eight unique canisters in just 18 inches of space so that when provided a token, kids can go pick out a unique prize. How can this be applied to different industries? If you’re a family or pediatric dentist, you’re sure to have had many difficult patients. While kids aren’t necessarily predisposed to being afraid of a dentist, dental work is often something they don’t understand or something they find uncomfortable. Around age two to age three, children start to understand when you tell them, “If you pay attention to the dentist and open wide, then you’ll get a token for a toy.” This cognitive understanding of if they do something, then they’ll get a reward, can help encourage positive behaviors in difficult situations. Dental offices are a great example of where a Treasure Tower could be used, and so are medical offices. Have you ever had to deal with a child that screams bloody murder whenever they come in for vaccines? If you are a pediatrician or family practitioner and you have a young patient coming in for shots, start the appointment by saying, “If you’re brave and strong, you’ll earn a token to go pick out a toy from the Treasure Tower.” This sets the expectation that the child needs to behave to earn their prize. Outside of the medical field, there are plenty of other industries that can benefit from a Treasure Tower Rewards Program, schools included. If you’re a teacher, and you ever struggle to get kids to bring in their homework, a Treasure Tower can help improve a child’s drive. A teacher can set a goal of turning in homework for two weeks straight and then reward with a token as the child earns the toy. Whether the school has a bit of extra budget to invest in a Treasure Tower or the PTA decides to add it to the schools “wants” list, a Treasure Tower can be a great way to encourage kids to listen to teaches and treat each other well at school. Anytime a teacher or administrative member sees a child do something nice, they can reward them with a token. There are so many ways in which a Treasure Tower can be used to encourage and bolster kids in many different situations. When you had your first child, you probably were a huge fan of carrying hand sanitizer and wet wipes for every occasion. No one could hold your child without cleaning their hands and you were constantly whipping out the wet wipes to keep your child squeaky clean. By child number two, the odds are, you probably didn’t care nearly as much about sparkly clean hands and having a spotless tyke running around. While you don’t mind as much on child number two, it’s still important to help reduce the spread of germs and other pathogens. But that’s often hard to do when children touch literally everything. So what can you do? Take a few tips from Treasure Tower Rewards, and try the following things out in order to stay healthy when cold and flu seasons come around. We all know how important it is to wash your hands. It’s true for children and adults alike in order to stay healthy. Washing your hands after you use the bathroom, before eating, or any number of other activities can help reduce the spread of germs. If washing your hands just bothers you or you can’t make the time, keep a small bottle of hand sanitizer on you. This creates a no-excuses way in order to keep your child’s hands and your own clean at all times. Your children may want to touch everything, and some even love to put everything in their mouths because they’re still just that young. So you know that anything children touch are sure to be germ petri-dishes. This includes treasure boxes found at doctors’ and dental offices. Kids can easily reach in and touch, or even lick, every toy in the box. This guarantees the spread of germs. Instead of letting your children pick from a treasure box, opt for providers who use vending machine toys and Treasure Tower to keep your kids as germ-free as possible. If your doctor doesn’t use a Treasure Tower, now’s the time to encourage them to get one! Along with washing hands regularly, it’s important to stay current on vaccines. The flu shot is a great option each year to boost the immune system and help your kids out. Younger and older individuals can definitely benefit from this vaccine and even if they catch a strain of the flu, it’s more likely to have a shorter downtime because of the vaccine. It doesn’t matter if it’s you who is sick or your child, either way the individual who is sick needs to stay home. The easiest way to pass germs is by being around other people when you’re sick, especially if you have a fever, and let’s be honest, you wouldn’t want the people around you coming to work or school sick. Do everyone the courtesy of staying at home to rest up before you return to a public space! Not only are Treasure Tower Rewards great for kids to have fun with, but they’re also a sanitary option for a medical or dental facility. Learn more about Treasure Towers on our website today!